What are the basic possessive pronoun? What is added to them in order to show ownership of something? 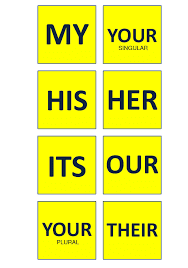 What is the position of this set of possessive pronouns? Let's connect them: Unsay imong ngalan? Now, there is another feature that you will learn, this is the y linker and it is another grammar feature in Visayan. You have already learned how to pluralize nouns as well as learned that "be verb" is absent in Visayan. This will be tackled further if you enrol in my online classes. See you around for the next lessons.